The Mets lead the major leagues in come from behind victories this season with 11. Something they rarely did last year. I remember watching games the last couple of years and when they were down after 5 innings the game was literally over. So the question is can they keep it up? The Pessimet in me will say no and this is an aberration. The Mets will come back to normal as the baseball gods have a way of bringing the law of averages into play. But there is a part of me that says maybe those gods owe us. Maybe they owe us for self-destructive seasons of 2007 and 2008, the injury destroyed 2009 and the bad 2010 and 2011 seasons. Could the corner finally be turning with the youth movement? Well they’re not exactly the Comeback Kids or a youthful team. 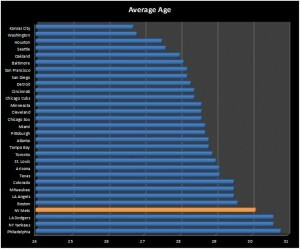 The Mets are actually the 4th oldest team in the Majors, (see chart I created below) just behind the Dodgers, Yanks and Phils. But you have to like the young core of the team Ike (26), Murph (27), Tejada (22), Wright (29), Duda (26), Nieuwenhuis (24) and Niese (25). It should be a fun season for no other reason except there are NO expectations, NONE. They’re playing hard, they seem to like each other and there is hope for the future with Harvey, Wheeler, Familia and Mejia on the rise. Can they compete for the second wild card spot all year? That remains to be seen. The Pessimet in me will always say expect the worst and hope for the best! Is it bad that I’ve actually been rooting for guys like Manny Acosta and Miguel Batista to pitch poorly? We know they’re going to stink eventually (one of them already does), so lets stop prolonging the inevitable, and get them off the roster! Batista & Byrdak, Dickey, and kind of screw up the curve. Torres and Bay are pretty old also, but I don’t think that they will be around next year.